Big Data Analytics – a nascent business area that had a glamorous start in 2012 is currently undergoing an image problem, especially in this part of the world. If Trust and Acceptance were represented as a curve, then Big Data is currently being pushed back to the early stages of the curve namely Skepticism and Suspicion. It will eventually pass these stages and arrive at Debate and a Slow Adoption (driven largely by peer pressure to begin with) before it reaches the stage of being comfortably Accepted. Since Big Data is somewhat nebulous by nature, here are a few helpful clarifications for the skeptics. Data which comprises, facts, figures, and statistics and so on, have been around for eons, even before the digital days. In this pre-digital era Data was collected, recorded and classified manually. It was entrusted and shared with select individuals within an organization, as a way of reviewing and planning. A basic example of this function is the Accounting division of a company or business; a Tax consultant who is engaged to offer financial expertise in tax laws; a market research agency hired to do a market sentiment analysis. The digital era -with underwater cables, ubiquitous Wi-Fi network, and intangible data warehouses deployed to handle terabytes to quintillion bytes of data every hour is making ‘Data’ seem infinite, voluminous, complex and ominous. In addition to that, this emerging business function under the catchall phrase, Big Data Analytics, has gained some mistrust and skepticism in the light of the recent Snowden revelations. Based on feedback from local businesses, it seems the ongoing allegations on data collection and tracking programs used by National security agencies is having an undesirable effect on the leaders who are at the helm of big corporations. There’s a scurry to isolate company networks from the vast boundless Internet and put a padlock in data systems to prevent any sort of snooping, eavesdropping or illegitimate sharing of sensitive data. This, of course is a sensible reaction to any possible threat to proprietary information. 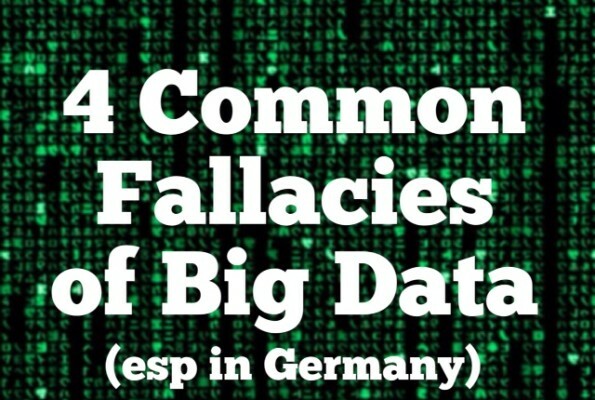 Here are a few related misgivings and common fallacies about Big Data. Even if a business doesn’t intentionally ‘collect’ Data, a substantial (and indelible) data footprint is left inherently by using any telecommunications network. Be it a website, a phone call, or a transaction on the internet, they are all imprinted digitally, either by a search engine or at the telecom service provider’s end. Whether the management of a company uses this data at all is a different matter. Not using or accessing data doesn’t leave a company or its digital footprints untracked or invisible. Data in its purest form, (as a number, a graph or a statistic) is not sensitive, critical or useful for business decisions – it is the insights drawn from data that is. For example, knowing there were 5000 visitors to your website on Sunday, by itself is not very useful data. But the analysis that more than half the visitors were accessing your website from their mobile devices through a monthly newsletter you sent offering deep discounts for electronic items, will offer insights that a business can benefit from. Hard Data is useful only when a business wants to measure its performance against goal(s) set beforehand or in case of specific questions. An insight that mobile phones could be used as fashion accessories by affluent women is an insight that cannot be derived purely from hard data residing in your databases and dashboards. It comes by deploying ground sources to observe usage patterns in selected demographic segments. On a conclusive note, I wish to add that a business can’t navigate a complex and changing landscape purely through Data Management and Analysis – one has to have a broader vision, an eye on macro economics and combine it with ground realities to apply data driven insights to business advantage.